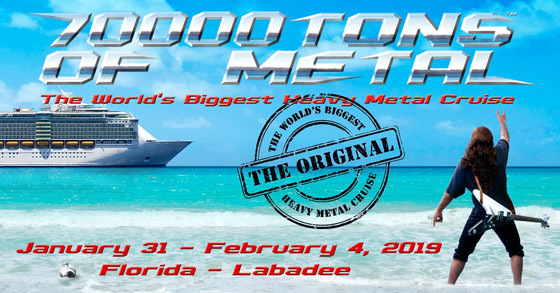 70000TONS OF METAL, The Original, The World’s Biggest Heavy Metal Cruise, has announced the Public Sales date and the first 28 of 60 bands for their ninth voyage, sailing January 31 - February 4, 2019, from Miami/Fort Lauderdale to beautiful Labadee and back. Public Sales will begin on Wednesday, October 3, 2018, at 12:00 PM EDT. Only 3,000 tickets will be sold. Prices start at USD 766.00 plus Taxes and Fees per person and includes on board accommodation, access to all performances, meals, and numerous special events including meet and greets with all bands on board. Sales for 70000TONS OF METAL Survivors (festival goers who have attended the event before) began on September 5, 2018, so limited tickets remain. Visit 70000tons.com/booking to book your cabin before they are gone. Max and Iggor Cavalera officially retired their extremely successful project RETURN TO ROOTS in 2017. Soley for 70000TONS OF METAL, The Original, The World's Biggest Heavy Metal Cruise, they decided to perform a World Exclusive one more time. MAX AND IGGOR CAVALERA RETURN TO ROOTS will be playing SEPULTURA's highly acclaimed album Roots, in its entirety. TIAMAT will be celebrating the 25th anniversary of the release of their groundbreaking album Wildhoney by performing the album in full. After reforming recently in 2018, VOMITORY will be celebrating 30 years of Swedish Death Metal on board.